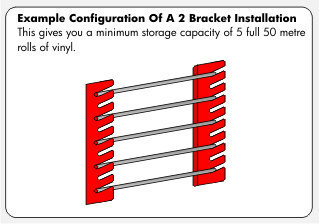 Use your walls to store your vinyl with the MDP wall rack. 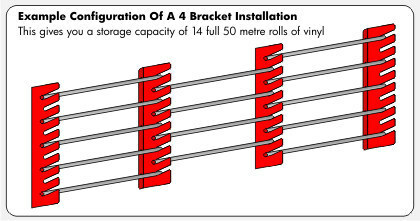 The wall rack packs consists of vertical brackets and aluminium mounting tubes for the vinyl. Each wall bracket is 775mm high and is made from steel so it is strong to cope with even the heaviest load. 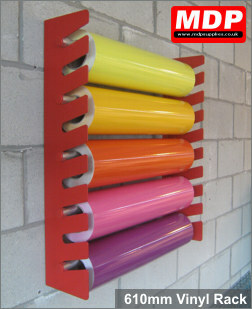 The aluminium mounting tubes are available in 3 widths so the wall racks can be used for 610mm, 1220mm or 1524mm vinyl. All packs include the appropriate number of tubes and screws / wall plug fixings. Holds up to 5 full logs of 50 metre vinyl. Holds up to 14 full logs of 50 metre vinyl. 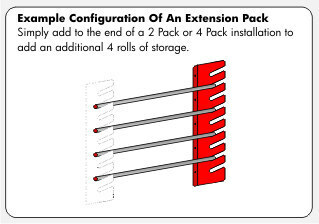 An extra bracket and mounting tubes that add an extra 4 rolls of storage to the above kits. Additional aluminium poles with end caps.